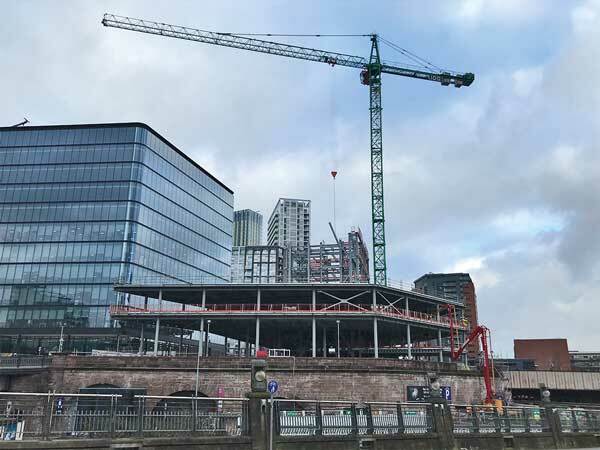 Structural steelwork is now under way on the 100 Embankment commercial scheme in Salford. The second of two adjacent office blocks, 100 will offer 15,500m² of BREEAM ‘Excellent’ office space over nine-storeys. Working on behalf of BAM Construction, Elland Steel Structures is fabricating, supplying and erecting 1,800t of steel for the project. Both office blocks sit above a three-level steel-framed car park that infills a Victorian masonry podium which once supported Exchange Station that closed down in 1969. Commenting on the scheme, Salford City Mayor, Paul Dennett said: “100 Embankment is a physical demonstration of the commercial development and investment in Salford.